A review on behalf of Wheels for Wellbeing. Every time I pick this book up I linger over the cover, looking at the variety of cycles and the people riding them. It’s rare to see a publication on cycling give equal billing to handcycles and trikes, and possibly rarer still to show the people riding them on an equal footing with other cyclists, making this a unique and lovely example of how to represent people in general and disabled people in particular. 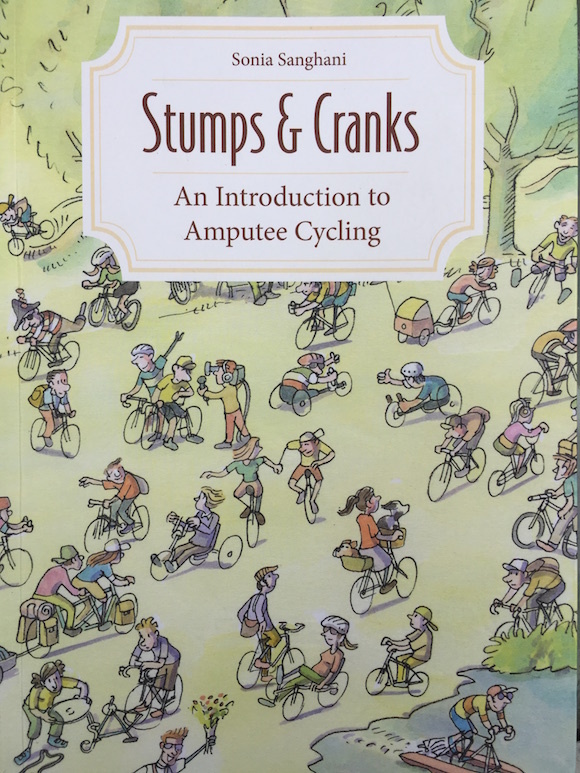 Billed as an ‘Introduction to Amputee Cycling’, Stumps & Cranks is comprehensive in its scope covering just about every aspect of cycling from scratch. Beginning with why an amputee should cycle at all, through all the various types of cycles, adaptions and prosthetics, and finishing with the paralympics, cyclocross and some of the challenges that stretch the more adventurous amputees, including the daily exploits of Wheels for Wellbeing’s very own Jim Bush in Croydon. Just cycling around South London can be challenging at times and I like the kind of variety covered here in people’s personal goals and achievements. An arm amputee being able to cycle to the market in Vietnam and carry 50 kilos of vegetables is a challenge to begin with, and the sense of independence and self-worth in getting the shopping home is just as rewarding as riding across a continent. Not that there’s anything wrong with endurance rides – a touchstone throughout the book is how a cycling goal can serve as a useful proxy for mental and physical recovery whatever the route or destination. These personal experiences of amputees are a major feature, the author having cast her net far and wide to include people from all over the world with a variety of amputations. I particularly enjoyed the contributions from places I’ve never cycled – who knew there was a Disabled Cycle Messenger Service in Afghanistan? And although I’m no beginner, as a cyclist or an amputee, I discovered things that were new to me like the ‘bum brake’ – slide bottom backwards to stop – and GlideWear patches for skin protection. Along with suggestions of further reading and things to try, each chapter comes with a short “Did you know?” section. 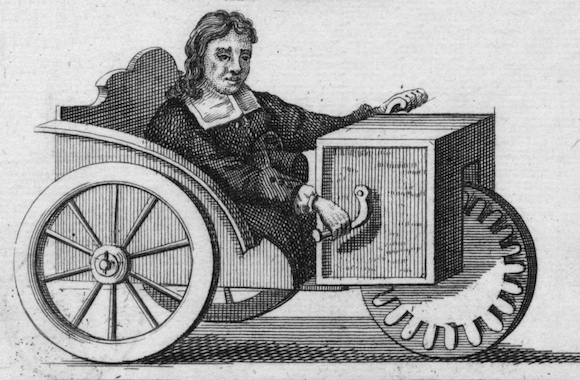 One of the things I didn’t know is that a disabled German clockmaker invented what we would recognise today as a handcycle all the way back in 1655! If he invented a time machine too expect to see him gatecrashing this year’s “200 Years of the Bicycle” celebrations. I was tempted to skip the chapter on nutrition – no mention of cake – but I’m glad I didn’t because I would have missed the story of a Swiss farmer who lost both arms to a baling machine and now rides an adapted recumbent trike. There wasn’t enough detail about the adaptions enabling him to steer and brake to satisfy my curiosity, however, because a web address is listed for many of the contributors it’s possible to get in touch and ask questions directly. 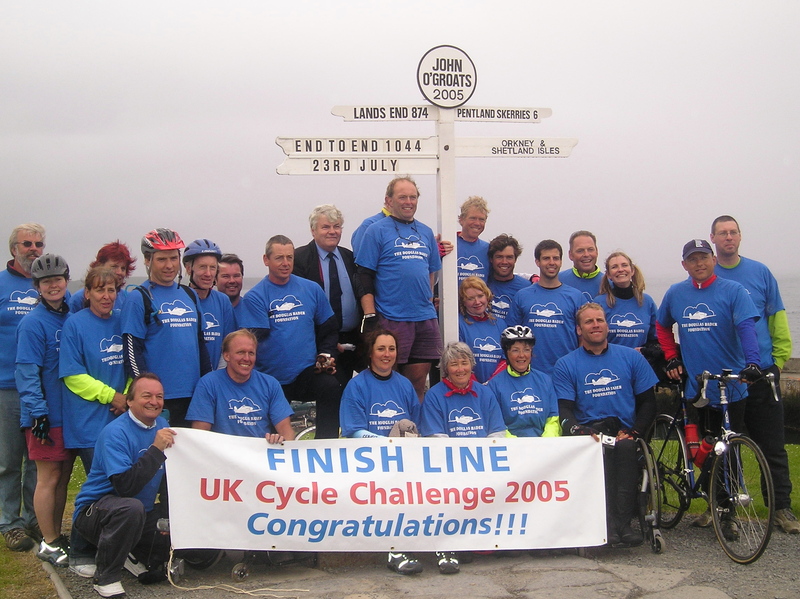 The list of contributors concludes with a request for more amputee cyclists to get in touch through the website, suggesting this is still a work in progress. I spotted a couple of things that slipped through the net if there should be a future edition – the swinging crank adaption and an amputee who cycles following a hemipelvectomy. Also, I couldn’t help noticing the use of ’bicycle’ to mean any type of cycle; it’s quite a common usage, particularly in International English and although within these pages it’s clear that things other than bicycles do exist, I would suggest the more inclusive term ‘cycle’ is preferable. Possibly because it is so comprehensive, with sections on how to fix bikes and how to read maps as well as how to eat, I came away feeling that the book hadn’t quite reached its destination. Something was missing, something that eventually becomes part of cycling life for many who take it up – how to make cycling better. Riding in heavy traffic is covered in the final pages; a fact of cycling life that most people find stressful and unpleasant if not frightening and life-threatening. For many disabled cyclists, and some amputees, getting off and walking isn’t an option when things get too difficult or barriers make it impossible to continue, and that shouldn’t be a part of the challenge. For those situations changing the environment is the only option, so I think pointing people towards campaign organisations working to make cycling better, and in particular working to make cycling as inclusive as it is on the cover, would put the cherry on the cake. Nevertheless, this plugs a large gap in contemporary cycling literature and I imagine it’s been quite a journey for the author – to go from non-cycling amputee to curator and writer of an authoritative book on the subject in the space of a couple of years is remarkable in itself. I hope the cycling is going as well. It also raises questions about gaps that may still exist. There’s an overlap between amputees and other types of disability – the same technical solution can work for similar capabilities – but as far as I know, what works for other types of disability and the experiences of those disabled people has yet to be gathered, recorded and made accessible in a similar way. Verdict: A great addition to the inclusive cycling book shelf and if the cover art isn’t already available as a print it should be! This entry was posted in Wheels for Wellbeing and tagged bikes, books, disability, mobility, words on Sat 29 Apr 2017 by kevin hickman. I used to despise blister paving. Sounds extreme now, but when it began to appear, seemingly out of nowhere, that response felt fully justified. At the time any lumps and bumps could be problematic, but when someone went out of their way to design what was for me a hazard and place it my path without any consideration for how it would affect me, it elevated tactile paving into a more significant issue than all the existing crap I had to deal with. It was a long time in coming – almost thirty years – but a solution eventually arrived that eliminated most of the problems I encountered with tactile paving and all the other flat-on-my-face hazards to do with surface variation and slopes. That was in 2009 and it came in the form of a new type of knee for my prosthesis1 which, other limitations notwithstanding, gave me the ability and the confidence to go pretty much anywhere in an urban environment because I could trust it not to collapse. What’s that got to do with crossing cycle tracks? Aside from the link between blister paving and crossing points, it’s an experience I can draw on to understand how someone might react when their environment is adversely altered having not been consulted. One such example being the RNIB’s response to TfL’s proposed changes outside its offices in Judd Street. Cycling advocates will be familiar with trying to draw what they consider to be a safe cycle network onto a map of their local area. The parts that qualify are often so few and far between that any network is almost nonexistent, or so fractured there are only one or two complete routes and those require a lot of local knowledge to find and follow. I imagine there must be people carrying out the same exercise to assess and map walking networks for blind people, with similar outcomes, but with an added investment in time and effort to memorise the routes with far fewer cues as to location. Disrupting a popular, safe cycle route is going to trigger an emotive response, so no surprise that threatening to disrupt an important link in the mobility network of blind people elicits the same. Yet the RNIB’s response did surprise cycling advocates. Despite subjective safety being a well understood concept in cycling circles, statistical arguments about the reduction in motor vehicle movements were being used to counter the objections, and the significance of replacing a pelican crossing with a zebra crossing was completely missed. The conclusion I draw from that is transport planners and cycling advocates are not attuned to, or are misunderstanding, what blind people perceive to be a safe environment. For a typical pedestrian, crossing a ‘filtered’ Judd Street is likely to be a trivial task; making use of the pelican crossing without waiting to activate it or probably not using it at all and following a desire line. For a blind pedestrian in a street with a lot of cycle traffic the need for a safe crossing point with a safe crossing time isn’t going to disappear with the motor traffic, and listening to the comments of blind people a significant proportion of them do not consider zebra crossings to be sufficiently safe. In 2014 Guide Dogs commissioned a report Road and street crossings for blind and partially sighted people which is subtitled The importance of being certain – and that’s the key point, the lack of certainty in when it’s safe to step off the pavement means zebra crossings are not considered a subjectively safe solution by blind people. That doesn’t only hold for a filtered Judd Street, it will also apply to a bus stop bypass. I hear through the grapevine that a working group of stakeholders have found that evidence gathered to date from monitoring bus stop bypasses shows that they are not inherently dangerous. That’s good news, however, if blind people are avoiding these bus stops because they don’t consider them to be safe, they are effectively excluded from the evidence base being considered. It’s essentially the same argument cycling advocates use to explain the lack of underrepresented groups cycling in a hostile environment – a lack of subjective safety leads to self exclusion and no amount of stats proving how safe it is for the people who do cycle, or training in how they do it, significantly alters that. What would make crossing a cycle track subjectively safe for a blind person? The obvious answer is the thing blind people keep asking for, a signal controlled crossing, but currently I would guess there isn’t a design that suits the smaller scale of a bus stop bypass. So what might a small-scale signal controlled crossing look like? The image above is a view of an informal crossing at a bus stop bypass on Blackfriars Road. The camera is looking towards St George’s Circus, the asphalt cycle track running between the pavement and the bus stop is about 3m wide and rises to pavement level at the buff coloured, perpendicular informal crossing, which is also about 3m wide. It’s not a busy bus stop and I’ve chosen it simply because it suits my purpose and the photo was easy to lift from Twitter – thanks @Phil_PJA! The button: a person activates the controlled crossing by standing on the pressure sensitive blister paving panel. The panel vibrates to acknowledge the user request to cross. The stop light: a strip of red LEDs embedded in the cycle track flash to stop approaching cycles. The tactile knob and audible beep: The blister paving panel vibrates and beeps for as long as it takes to cross, after which the red LEDs stop flashing. Solar City are manufacturing roof tiles with a process that would probably suit blister paving. Could a non-slip surface be incorporated too? The force sensing and vibration is a scaled up version of Apple’s taptic engine. Would vibrating a whole human be too tall an order for it? Motion sensing’s nothing new, assuming it can be tuned sufficiently to reliably sense approaching cyclists. Embedded lighting has been used to stop motor vehicles at cycle crossings in the Netherlands. In addition to the crossing functionality the blister paving panels could integrate beacons to aid navigation forming part of a network throughout towns and cities. Could it work? At this year’s Disability Studies Conference one of the authors of the Guide Dogs report mentioned earlier, Bryan Matthews, presented a paper Where To Go Next? Technology and visually impaired people’s mobility in which he advised some caution in relying on technological solutions that require users to equip themselves with additional devices. Expense, complexity, reliability and sensory overload being some of the reasons that mean seemingly promising solutions may not work as well as first envisaged. What I’m proposing here, like my new knee, is a technological solution, but it doesn’t rely on the user having an additional device or on a third-party’s system. It’s essentially a reconstruction of an existing solution. How might its feasibility be tested? PAMELA springs to mind. Back in April, Mobility for an Ageing Population included a tour of the Pedestrian Accessibility & Movement Environment Laboratory in Tufnell Park, which as well as being a research facility seemed to have people with all the skills needed to put something like this together. I can’t see the obvious flaw – yet – but there could be any number of reasons why it wouldn’t be successful in practice: counterintuitive; confusing; the vibrations spook guide dogs; the electronics drown in flash floods; not enough incident light to power it. Whatever the outcome though, I’m convinced a more inclusive solution than the ones currently available is required. Architects and planners have been pursuing an uncluttered place-making aesthetic, loosely referred to as Shared Space, giving little apparent thought to, or making false assumptions about, how people with different constraints and capabilities will move through these places safely and efficiently. I’ve deliberately taken into account this emphasis on place-making with a visually unobtrusive design, while at the same time (I hope) maintaining a clear, formal method to interact with other modes (people on bikes, in cars, etc) for those pedestrians who need it in order to feel comfortable with using the space. In this case it’s a bus stop bypass, but the same could be applied to other contexts such as Exhibition Road or Frideswide Square. Bearing in mind the cost of granite paving, surely it’s possible to design pleasant places to be without having to sacrifice anybody’s mobility and independence. Should anyone in the business get this far, consider that a gently tossed gauntlet. This entry was posted in Inclusive Cycling Forum 2.0, Uncategorized and tagged bikes, design, disability, infrastructure, mobility, words on Sat 12 Nov 2016 by kevin hickman. This entry was posted in TGiF and tagged bikes, disability, flick, indian, mobility, mumbai, society, video on Fri 31 Jul 2015 by kevin hickman. Today was a day of lasts; the last time we would have breakfast together, set off together, ride together, suffer together. The ride didn’t start easily – plenty of hills, but as the miles ticked away euphoria set in. So much so we were in danger of riding into each other! In the cold light of day John O’Groats really is a God forsaken place, only 3 weeks of hope, guts, compassion, humour and down right bloody mindedness could make it anything else. All made complete by the welcome committee, champagne, success and relief – you had to be there! And if you had, you would have had a piece of the giant British Isles cake at the celebration meal in the evening. Baked by Jo, everyone had a chunk of their county and I think Big Jim, true to form, had the rest! This entry was posted in E2E2005 and tagged bikes, disability on Thu 23 Jul 2015 by kevin hickman. Had an early stop at Invershin Falls. Saw 1 salmon trying to leap up the white water of the water fall. Once we were out of this (delightful) valley we spent the rest of the day crawling into a gruelling headwind. Because of the conditions this leg challenged Dartmoor as the toughest of the tour. The weaker riders soon learnt the benefit of following a wheel, and the whole party was split into small groups tucked behind a stronger rider. Towards the end it rained as well! This entry was posted in E2E2005 and tagged bikes, disability on Wed 22 Jul 2015 by kevin hickman. We left Inverness maximum security YH pretty much on time and made a textbook exit through the town and over the windy Moray Firth. First stop was Muir of Ord where we had made the local paper (photoshoot at Oban), many pensioners came up to us offering donations – the Scots don’t live up to their reputation for thrift! This entry was posted in E2E2005 and tagged bikes, disability on Tue 21 Jul 2015 by kevin hickman. Health Warning: Don’t eat a Chicken Jalfrezi and drink several (read as lost count) different real ales before a long day’s cycling. It took a few hours to get into it this morning. Despite that, it was a long day but a great day. The scenery riding alongside Loch Lochy, Loch Lihne, and Loch Ness was outstanding. Even Kiwi Nathan from Lord of the Rings country thought the view from above Loch Ness was breathtaking. This entry was posted in E2E2005 and tagged bikes, disability on Mon 20 Jul 2015 by kevin hickman. Jenny left us today. She’s carrying on to the Isle of Mull – our original route. As a group we made the unanimous decision to ride straight to Fort William rather than go via the Isle of Mull and 3 Ferries. This saves a few hundred pounds on the cost of the trip and hence increases the money made for the charity. The most striking memory today was of the huge streams pouring down the sides of the mountians. 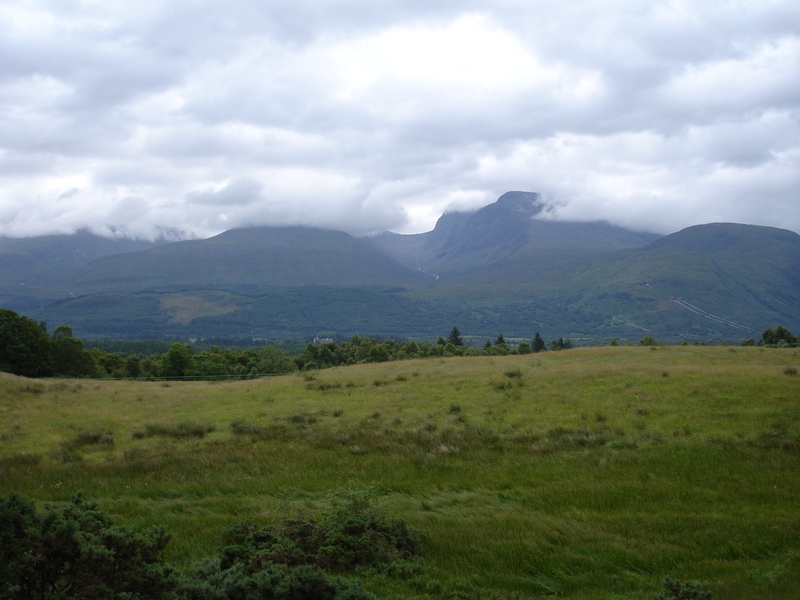 From a distance they appear as a thin silver line, thickening as we ride towards them into a succession of waterfalls and a roar as they pass under the road and into the Lochs. Once in Fort William we managed to get an hour’s shopping done, including the maps I’d “lost” this morning. Also picked up a bottle of “Avon Skin So Soft” from the Rod and Gun shop – this is the preferred protection against midges used by the locals. Even remembered to get a birthday card for my 15 year old daughter – I’m beginning to get the hang of this parenting lark. This entry was posted in E2E2005 and tagged bikes, disability on Sun 19 Jul 2015 by kevin hickman. With the ferry back to the mainland to catch at 0815 there was some very hasty packing to be done in the morning. It transpired that our washing from the night before had become mixed up with another group’s at the youth hostel and my £20 cycling mitts I’d bought the week before had transformed into a pair of baggy old Y-fronts – I know which I’d rather do without! This entry was posted in E2E2005 and tagged bikes, disability on Sat 18 Jul 2015 by kevin hickman. This entry was posted in E2E2005 and tagged bikes, disability on Fri 17 Jul 2015 by kevin hickman. Raceday. We had an appointment with the ferry to Arran this afternoon at 1530 so an early start was required. 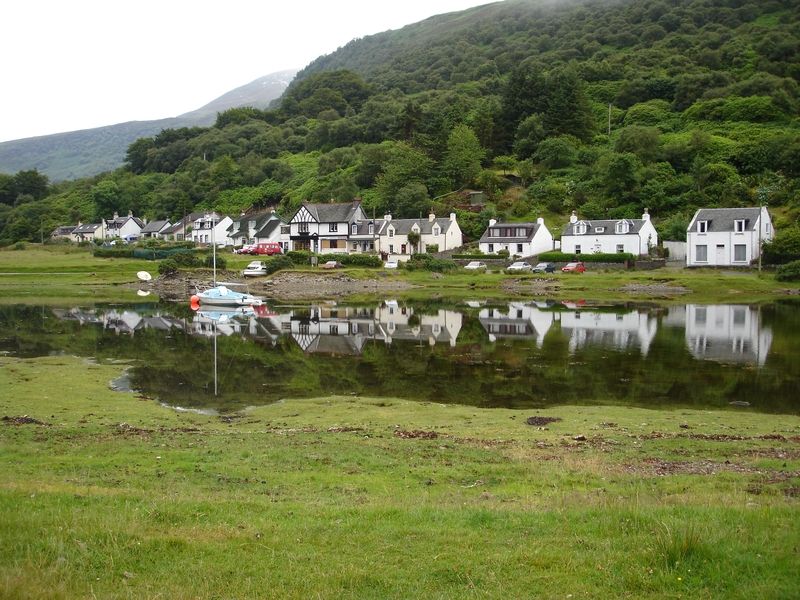 There was a later ferry but that would have meant getting to the Lochranza YH at about 9pm. We were a little (slight understatement) late getting away but made good progress once we had. All this despite a stiff northwesterly headwind pretty much all the way. Since we arrived in Scotland the temperature has been signicantly lower than we’ve become accustomed to and each day has been accompanied by an energy sapping headwind. This entry was posted in E2E2005 and tagged bikes, disability on Thu 16 Jul 2015 by kevin hickman. This entry was posted in E2E2005 and tagged bikes, disability on Wed 15 Jul 2015 by kevin hickman. Due to a clerical hiccup the Carlisle Rehab Centre were expecting us at 9:00am this morning, which with no reported wormholes or temporal distortions in the area remained steadfastly inconsistent with our location of Kirkby Stephen 44 miles away. The outcome was to form another band of elite cyclists who rose at 5am and left at 6 with a view to making Carlisle in 3 hours to meet up with the rest of the group who took the minibus to the centre. The advantage for the early riders was that we had the rest of the day off to go to the Globe, the Walkabout, the Cinema (War of the Worlds – not recommended) and Wetherspoons, while the other riders were bused back to Kirkby Stephen to ride over in the afternoon. We made it in 3 hours, arriving just after the minibus. This entry was posted in E2E2005 and tagged bikes, disability on Tue 14 Jul 2015 by kevin hickman. This stage was billed as the hardest of the whole tour, and added to that we had an apointment with the Preston Disablement Services Centre. Because of this, four of the faster amputees (myself, Nathan, Richard and Jim B) went to the limb centre with the intention of catching up with the main group by lunchtime. 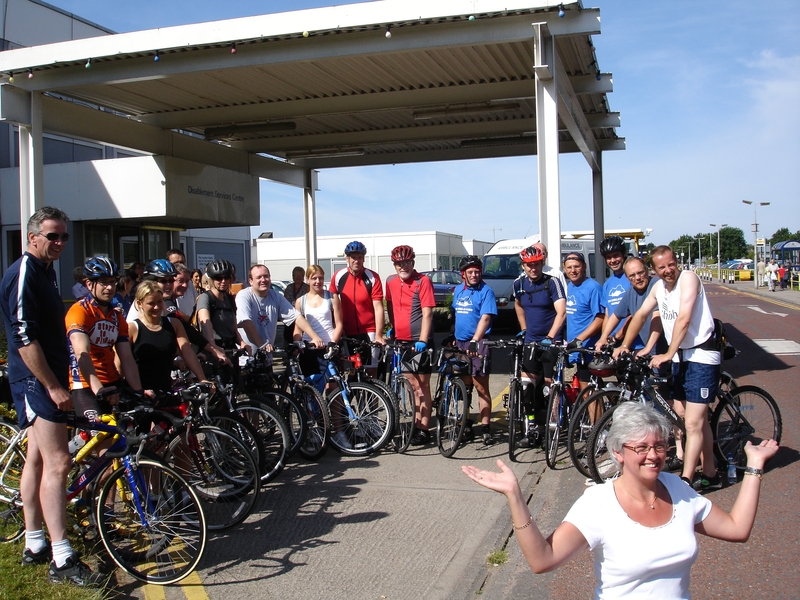 As you can see in the picture below, we had a lot more than four cyclists setting off from the limb centre! In fact about a dozen staff from the centre joined for the first part of our ride – prosthetists, orthotists, therapists, receptionists… all good company. This entry was posted in E2E2005 and tagged bikes, disability on Mon 13 Jul 2015 by kevin hickman. Well, I’m not sure I’m speaking for everybody but I for one was glad to be back on the bike today. Not least because of the problems I’ve been having trying to update the website. I think I’ve got to the bottom of it now though, essentially, using the mobile phone at 9.6k to upload files bigger than about 18k results in them being corrupted. I haven’t got the time or the patience to make it ftp the bigger files correctly using this set up so I’m emailing them back to my wife Brigitte and talking her through uploading them to the site. Thank God for technology! This entry was posted in E2E2005 and tagged bikes, disability on Sun 12 Jul 2015 by kevin hickman. This entry was posted in E2E2005 and tagged bikes, disability on Sat 11 Jul 2015 by kevin hickman.